Most people have purchased yachts just to embrace their life in the ocean and to show their wealth. Few rich people buy it to experience the feeling of spending some days in the ocean with the luxurious features like their own home. These yachts are so lavish and well equipped that they have all the comforts and qualities. In our previous list of the largest yachts in the world, we ranked them according to their length. In the following list, we align them according to their price. Read and enjoy the following list of World’s Most Expensive and Luxurious Yachts. The Rising Sun is a luxurious yacht, initially built in 2004 for Larry Ellison, owner of Oracle Corporation. This motor yacht was designed by Jon Bannenberg and built by Lurrsen. Now it has been owned by David Geffen since 2010. It is 138 meters in length and quipped with chromium plated hawseholes. It has 8000 square meters of living area with 82 rooms on five floors. It is powered by diesel engines which give it a maximum speed of 52 km/h. Its other features are private cinema, spa, gym, basketball court and a helipad. A Netherlands based Oreanco Company built this beautiful yacht in 2011. This is designed for the most influential Hollywood filmmaker, Steven Spielberg. It is only 86 meters in length but has many luxury and lavish features. It has a big pool with a glass surface that can be used as a movie screen. It can house up to 12 guests and 26 crew members. It is equipped with a gym, helipad and a private deck. Lady Moura is a private luxury yacht owned by a Saudi Arabian businessman, Nasser Al-Rashid. It was built by Germany based Blohm and Voss builder in 1990. It is 105 meters in length and has many features such as a helipad and a powerful engine which give it a maximum speed of 37 km/h. Most of the interior of the yacht is made up of 24 karat gold. From this, you can imagine the luxury and comfort inside it. Al Mirqab is another classy and magnificent yacht, owned by the Prime Minister of Qatar, Hamad bin Jassim bin Jaber Al Thani. It was launched in 2008 and constructed by German based, Peters Schiffbau Wewelsfteth. It is 133 meters in length and ranked among one of the best yachts in the world. It is fully equipped with swimming pool, bars, cinema, a helipad and large place for sun bathing. This yacht can hold up to 24 guests in 10 super deluxe suites and has 55 crew members. Dilbar is a wonderful motor yacht built by Lurrsen in 2008. She is owned by a Russian businessman, Alisher Usmanov and is named after his mother. Its interior is done by Alberto Pinto. It was designed by Tim Heywood and has a capacity of only 20 guests and 48 crew members. It is equipped with a modern stabilization system which reduces rolling effects and gives more enjoyable experience. Al Said is a super luxury yacht built by German based Lurrsen in 2007. It was named after its owner, Sultan Qaboos Bin Said Al Said of Oman. It is world’s fourth longest yacht with 155 meters and has most powerful engine which generate 16,500 KW of power. It can accommodate up to 70 guests and 154 crew members. It features classy wood walls, huge entertaining space and a concert hall for performance. Superyacht A is simply known as A, designed by Philippe Starck and Martin Francis. It was commissioned in 2004 and construction completed in 2008. It is owned by Andrey Melnichenko and most of the interior was designed by his own wife, Aleksandra Melnichanko. It has all the features of a super luxury yacht. It is powered by two diesel engines which give the yacht a maximum speed of 43 km/h. Some of its unique features include stingray hides on the walls and crocodile skinned furniture. Dubai is a private yacht, built by a joint venture between Blohm and Voss. Its construction was initiated for Prince Jefri Bolkiah of Brunei and named as Platinum, Panhandle and Golden Star. Now it is owned by Sheikh Mohammad bin Rashid Al Maktoum, Prime Minister of the UAE. It is equipped with a helipad, swimming pool and a spa. It has also been called a floating city because it features all the things a person could want. Eclipse is a luxury yacht constructed by Hamburg and German based Biohm and Voss in 2009. Currently the yacht was owned by a Russian businessman and owner of Chelsea Football club, Roman Abramovich. It features two swimming pools, 24 guest rooms, two helicopter landing pads and a mini submarine. 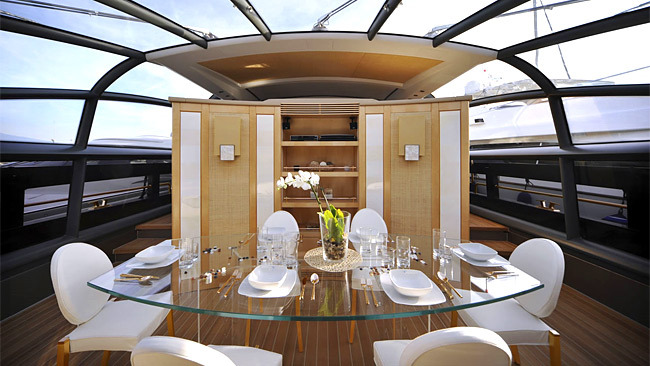 It can accommodate up to 70 crew members to maintain the yacht and serve the guests. It is equipped with an intruder detecting system which detect nearby cameras and block camera lenses using a laser technology. History Supreme was built by United Kingdom based Start Hughes and company and owned by a Malaysian businessman. Most of the interior was decorated with 100 ton gold and platinum. The owner of this yacht has so much money that he spends more than $3 billion on decorations. Its interior also features 18.5 carats, the rarest diamond in the world. It has some more unique features including a statue made from meteorites and T Rex (dinosaur) bone. The Truth: All of you might believe it, but the History Supreme is not real. There is no such anonymous Malaysian businessman. Can you imagine 100 K gold and diamond on a 30 meter yacht? Stuart Hughes copied few pictures from the internet without the owner’s permission and modified them. The news goes viral after a few days and when people asked him about that, he gave no answer. We have included History Supreme Super Yacht in this list just for you to know the truth behind it.